Your visual thinking is asked to abandon the viewing angle nourished by the evolution of need to observe the landscape for food and danger. In addition, visual art has strong preference for the the eye/head to be in 90 degrees to the horizontal when painting or photographing a landscape. There are intriguing departures though. Until 15th C, when the Danube School broke the cannon by Aristotelian trust in observation, landscape representation derived for its role in the story. In Giotto or Duccio – the role of detail signifies the illusion of being there, and witnessing. He paints the crown of a tree as if he was not only inside it, but also climbing up to each leaf/fruit, all represented from the same near distance. Manipulation of believable distance is one of the optical tools to achieve foregrounding of otherness. The discrepancy between size of the figures and the building and trees , and between distances, is not to approximate perspectival distortion, but to assign significance. As a trusted toll it is found in Egyptian and Byzantine art. 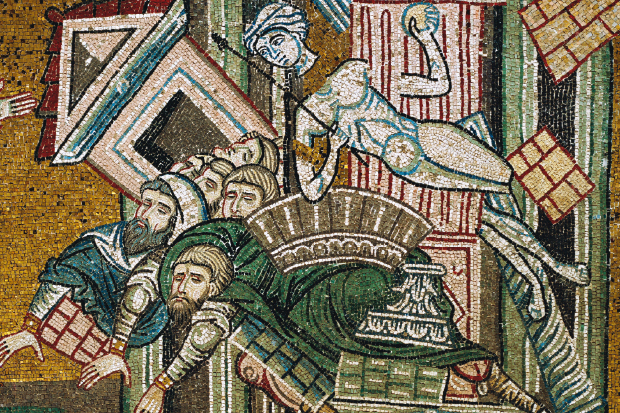 This is a detail of the mosaic depicting the martyrdom of Saints Castus and Cassius in the cathedral of Monreale, Sicily, 12th C every part is seen for the same near distance. Of specific interest in relation to FitzGerald’s photographs of Connemara is the irrelevance of rational space. That in itself has been mined by Modernism of the 20th C in many ways, including a rational insertion of geometry into lens based view of the landscape, by Jan Dibbet. FitzGerald trusts simplicity: just turning the image 90 degrees looks like a mistake waiting to be corrected, my head instinctively bends to get the “right” view. Only if I scroll without lingering from an image to an image the habitual expectation makes way to perception of the strange unease forged by competition of the known with unexpected. That denial of the norm appears as necessary. Victor Shklovsky and Bertold Brecht have some thought on this. FitzGerald emailed me that making-strange – Verfremdung is one conscious part of his intention. My art historical example illustrates that it has roots in the need to make something believable – but not as a document. The biblical stories were to be made visually believable, so the optics aimed at a convincing scene. Dibbet is concerned also with representing the whole from observable parts, this time ruled by geometry – not biblical stories. His introduced otherness (mostly also right angle) reaches towards the sublime while holding back before it tips over into the strange. FitzGerald’s strange landscapes go deeper, behind the belief, below the rational and optical. They depend on their power to induce the vertigo like experience moving from unpleasant upheaval to calm acceptance of another world, otherness being just this simple strangeness of a small, 90 degrees, turn of viewing angle. My instinct is, that FitzGerald’s images activate the amygdala, my early warning system. Especially when I compare them to the mosaics at Monreale – the house is not upright – but does not induce the strangeness of the intensity and persuasion these images of Connemara do. Right angle is such a tame creature – yet, here it is endowed with animalistic force. Or – the force we know so little of – and which astronomy accepts as a part of the universe. FitzGerald manages to present an approximation of how the familiar tips so easily out of anthropocentric system. This entry was posted in essay and tagged B Brecht, Connemara, Giotto di Bondone, Jan Dibbet, photography, right angle, V.Shklovsky, visual thinking. Bookmark the permalink.